Losing charm: Nearly 45% of India’s gherkin exports, valued at Rs502 crore for the year ending March, go to Russia, followed by the US, Canada and Europe. Bangalore: Gherkin exports, which have grown at a compounded annual rate of 30% over the last three years, may slow to about 10% in the current year because of tepid demand from Russia, a key market. Rising real estate prices and shortage of agricultural labour in the traditional gherkin growing areas of Karnataka have also impacted operations of gherkin exporters. Real estate prices in semi-rural areas surrounding Bangalore have shot up by more than 300% since 2001 and this has forced exporters to venture into other parts of south India to grow the small, cucumber-like vegetable. 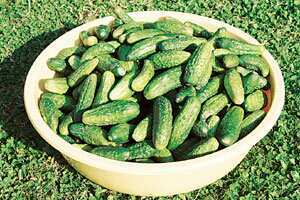 Gherkin is a 100% export crop as there is very little domestic consumption in India. Nearly 45% of India’s gherkin exports, valued at Rs502 crore for the year ending March, go to Russia, followed by the US, Canada and Europe. Bottled gherkins pickled in vinegar comprise nearly 50% of the exports. They are consumed in these countries as pickles. Karnataka accounts for nearly 70% of India’s gherkin produce and it is mainly concentrated around Bangalore and adjacent Kolar district. The first gherkin export zone was set up in the region in 2001-02 because its moderate climate suited the crop. “Currently, there is hardly any contribution from Bangalore and Kolar," maintains G.V.G. Rao, a Bangalore-based exporter and president of the Indian Gherkin Exporters Association. “Land use planning has been changing and a lot of land around Bangalore is going out of cultivation. Ten years ago, floriculture and cultivation of high value vegetables flourished in this region," notes N. Nagaraj, professor, department of agricultural economics at the Bangalore-based University of Agricultural Sciences. The depletion of groundwater has also contributed to this, he says. Meanwhile, the reduced availability of agricultural labour in the traditional growing areas has meant that exporters are looking at new areas such as Dharmapuri in Tamil Nadu and Kurnool in Andhra Pradesh, according to Rao, who runs Global Green Co. Ltd, which is part of the Gautam Thapar-led Avantha Group. But some exporters note that local climate conditions in those states will lead to a different gherkin quality. “The colour and texture is not the same and these are important when supplying to discerning international markets," says Vivek Nayak, managing director of Ken Agritech, another gherkin exporter. Global Green’s Rao, who expects 10% growth in exports, says there are around 15-18 gherkin processing units in Karnataka, and a handful in Tamil Nadu and Andhra Pradesh. “The growth is not spectacular because imports from Russia have come down," he added. “The farmer base is going away and now gherkin cultivation is more widespread and costs are increasing," said Pradeep G. Nair, president of Koeleman India Pvt. Ltd, a Bangalore-based gherkin exporting firm.